I know it’s not zucchini season, but I saw some decent-looking ones in the store the other day and couldn’t help myself. Craving chicken cacciatore on a warm spring night, I thought this creamy, lemony zucchini spaghetti salad would be perfect to serve alongside. The technique of salting the zucchini and then letting it sit removes moisture. The result is crisp zucchini that isn’t liquid-logged. During summer months, when you have zucchini overload from your garden (or your neighbor’s), remember this recipe. It’s simple, won’t heat up your kitchen, and is extremely versatile. Try it with grilled chicken and thick slices of ripe, juicy tomato. The dressing is also featured in Crab Salad with Lime and Avocado and Quinoa Salad with Spinach, Parsley and Spring Onions. If you have a mandolin, use the julienne blade to slice the zucchini into long strips. If you don’t, cut the zucchini lengthwise into three or four slices, then cut each slice into thin strips. Place zucchini in a colander and set the colander over a large bowl. Toss zucchini with salt and set aside for about an hour. Pour off the liquid and blot the zucchini dry with paper towels. Place in a bowl and mix with just enough dressing to coat the zucchini. Nutritional information does not include the dressing. See dressing recipe for its nutritional information - you'll need 1/4 cup = 4 tablespoons or 2 servings of the dressing. The sodium count is a bit misleading as some of the sodium will drain off with the liquid from the zucchini. 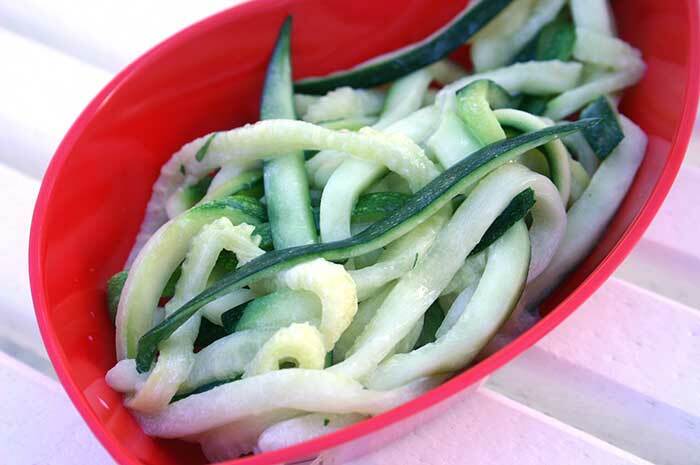 You can also use a spiralizer to slice the zucchini into long strips. This is a wonderful and fresh side for many main dishes! I just thought about grilled shrimp on top of your salad as a meal. My family loves lemon in everything! Thanks for sharing!